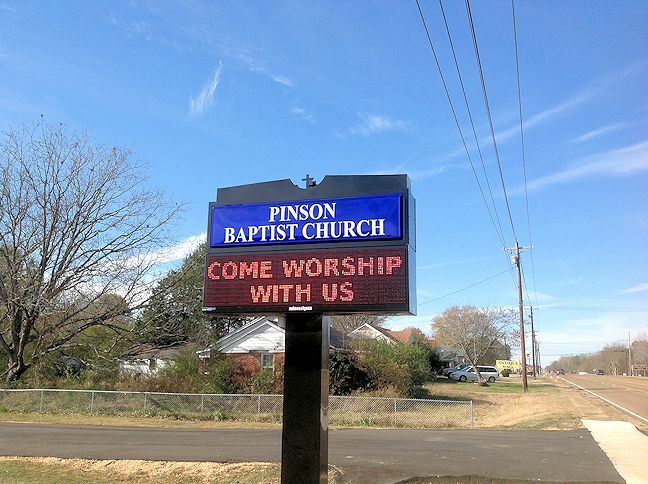 Pinson Baptist Church - Welcome to Pinson Baptist Church! "Pinson Baptist Church Loves Jesus, Loves Pinson"
HAPPY EASTER! WE SERVE A RISEN SAVIOR! HE'S ALIVE AND HEAVEN'S GATES ARE OPEN WIDE! We invite EVERYONE to come visit our church and listen to our pastor, Bro. Jimmy Burroughs. Bro. Jimmy uses the New King James Version Bible for scripture in his sermons, and also refers to King James Bible wordage in his discussion of biblical text. To learn more, with contact info, please click on "Our Pastor" in the menu above for more information. If you have left our church in the past over a previous pastor using a too modern translation of the Bible, we invite you to return to PBC to listen to Bro. Jimmy. If you left over previous personalities, we invite you to return to PBC for Bro. Jimmy and his wife, Carol's, loving attitudes. If you are searching for a loving church, using a traditional Bible reference, we invite you to come to Pinson Baptist Church. All are welcome here. We don't care if you wear a suit or t-shirt and shorts, you are welcome at Pinson Baptist Church. If you are looking for a caring, loving church, a church that loves Jesus, loves Pinson, then you have found it! We invite you to join us for fellowship and worship as we praise God and His Son, Jesus Christ with song, prayer, and Bro. Jimmy's sermons. Click on the Facebook logo to go to our Facebook page. We are located at 111 Church Street in Pinson, West Tennessee, between Bear Creek Rd. and College St, just one block west of Hwy 45-South. 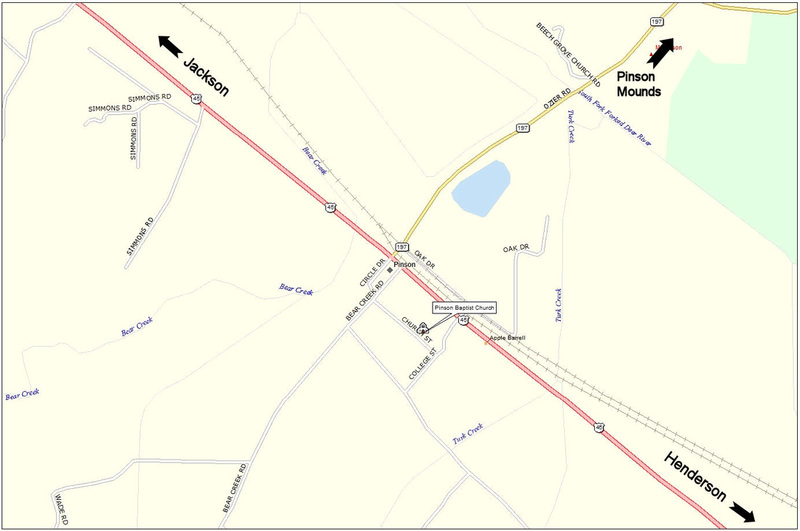 Pinson is located along Hwy 45-South, halfway between Jackson (to the north) and Henderson (to the south). Off the 45-South, we are basically behind the Old Pinson School, one block in, on Church St. You will find our electronic sign out on the 45-South, and can turn into our driveway there, or you can turn on Bear Creek Rd or College St, and then turn on Church St to the church. To use zoom-able Google Maps or get driving directions, click here. Join us for Sunday worship, and Wednesday bible study. To navigate this web site, you may click on any category in the black band menu above for an informational overview, or click on any drop-down menu item for more specific viewing. Thank you for visiting Pinson Baptist Church on the web, and we would love to see you in person at our church. For our Sunday and Wednesday services hours click on the "Service Times" tab in the above menu, or click here. If you live too far away to make it to our church, but still would like to listen to the church sermons, then click on the "Sermons" link in the above menu bar, select the year and month to listen. Sermons are generally uploaded each Sunday afternoon and evening, after each church service. 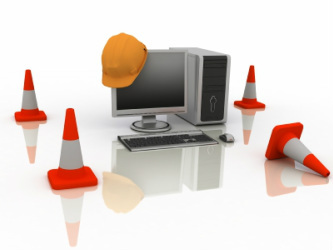 This web site is under frequent update. Please visit us again, and God bless!